A man has been reunited with his battered lost camera after his pictures were shared on social media. Peter Sandground discovered the SLR in the River Etive in the Highlands while he was working on a commercial shoot and retrieved the memory card. The photographer then managed to recover a series of images which were captured on New Year's Day 2017. After a social media post was shared more than 1,200 times the mystery owner was identified as Charlie Davidson. The oil industry engineer, from Peterhead, had been shooting in Glen Etive, which has featured in movies such as Braveheart and Skyfall, on 1 January, 2017. Mr Davidson, 48, set up his tripod and camera for a long exposure next to the river. But while he went back to his bag to get a filter, his tripod and camera were swept away. The last picture taken was a mile away from where Mr Sandground found the camera 10 months later. Mr Sandground said he had been working on a shoot for a campervan company in Glen Etive in October when he found the damaged camera. 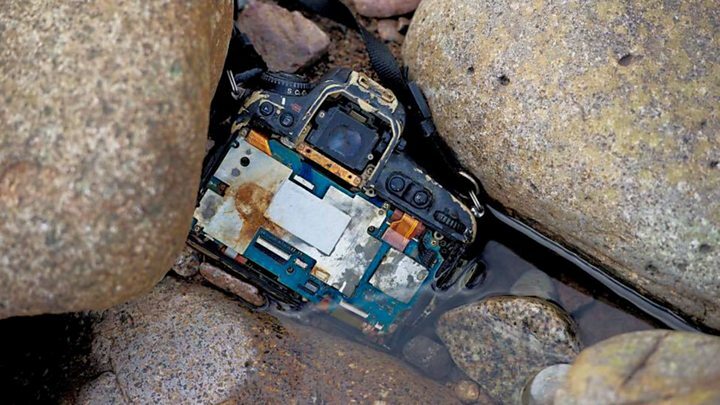 He said: "I was right down in the River Etive and setting up a shot and I glanced down at the rocks I was standing on and I caught a glimpse of a smashed-up Nikon DSLR. "I pulled it out of the rocks and dried it off and I could see the memory card was still relatively intact and I just thought I'll have a nosey at that later." Image caption Charlie Davidson's last image of Glen Etive before his camera was swept away. With the help of an expert, he recovered striking images of Buachaille Etive Mòr, Glen Etive and Slains Castle in Aberdeenshire from the camera's memory card. The Glen Etive photos had been taken on New Year's Day morning last year. Mr Sandground added: "These shots were long exposures that I could clearly see where taken by someone that quite obviously knew their way around a camera and knew how to work with natural light, and depth of field. "I have to admit, once we recovered the shots, I couldn't help myself, I rammed up the contrast on them and the truth is, they are professional standard, beautiful shots that someone had clearly put a lot of thought and time into." On Monday he published the shots on Facebook and they were so widely shared he managed to trace the grateful owner. Mr Davidson said: "I am stunned that Peter has managed to track me down. "It's a really thoughtful thing to do. "And I am massively flattered with the feedback on the shots." Describing himself as a "passionate amateur", he said he was delighted with the pictures that he never thought he would see. Mr Davidson added: "I can clearly see from Peter's photo of my camera that it is well and truly gubbed but I am amazed that the memory card has survived. "I am actually really chuffed with how the shots turned out!"